The Book Rat: #FairyTaleFortnight Giveaway Hop — enter to win a box of fairy tale goodies! #FairyTaleFortnight Giveaway Hop — enter to win a box of fairy tale goodies! 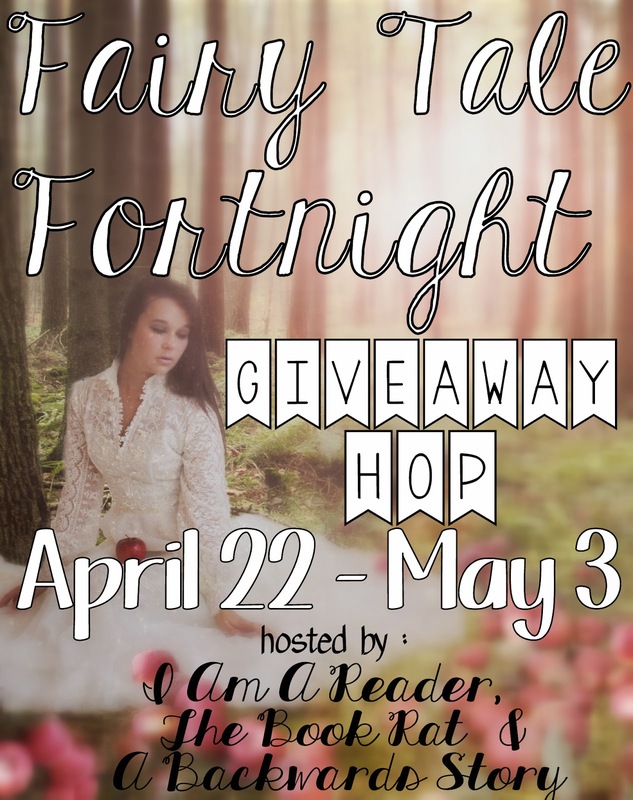 Once again, Bonnie and I have teamed up with Kathy from I Am A Reader to bring you the Fairy Tale Fortnight giveaway hop! There are nearly 100 unique giveaways going on in this year's hop, so lots of chances to win something amazing to fill your fairy tale fix! Deciding what to give you fairy tale lovers is one of the delights of the event for me, but also one of the stresses — I want you to be able to read all of my favorites! So what's up for grabs? Well, your guess is as good as mine! Some of you probably know I delight in doing mystery boxes, partly because it's fun to try to match the book to the person, and partly because it's a surprise even to me what I'll come up with! It keeps things lively. ...and you like to live dangerously, you can choose the Mystery Box, filled with at least 3 books of my choosing, and maybe some other random surprises (who knows? It's a mystery!). All I can promise is it will all be fairy tale related, and it will all be awesome! OR if you're the less adventurous type, you can choose to receive a fairy tale retelling (or fairy tale related in some way) of your choosing, up to $15 from either Book Depository or Better World Books. So it's up to you! You're of course welcome to "suggest" in the comments some things you might be interested in (give me some hinty hints! ), but other than that, just follow the rules, fill out the Rafflecopter, and keep your fingers crossed! **To enter this giveaway, you have to be registered on the Giveaway Registration Form. Please make sure you have registered, and please do not leave any personal info (like your email) in the comments. This giveaway IS international, and it is the only giveaway during FTF to end early - it's open until May 3rd! And make sure to visit all of these awesome stops and enter their fairy tale giveaways! Cruel Beauty hehe. Or Heart's Blood. Truthfully the surprise from not knowing what is in the box would be more exciting than anything on my wishlist. I would choose the surprise since I like a lot of different stuff and love surprises! I really hope that there will be Scarlet or Cress in the mystery box :) Thanks for the giveaway! I love surprises, and I love to see what people put in mystery boxes. They're so fun! the mistery box is international? if is im in! I would love the mystery box. I could use a great surprise right now. thanks for the giveaway. I'm feeling bold today so I'd choose the mystery box! I think I'd enjoy it being a surprise that someone chose, and may even get some books that I didn't know! :) Thanks for the giveaway! I'd like to get bedtime stories and/or children literature books. Most of them are fairy tale books. I actually love surprizes..so it would be fun to see what you would choose to put in the mystery box! I'd definitely hope for a little something extra with the books in the mystery box, because then it would be extra mysterious. The Mystery Box would be awesome! But heeey, surprises are fun! I know for sure that anything you think I will like, I will definitely like. So many of my all time faves are Misty recs. I would DEFINITELY opt for Mystery Box. I completely trust your judgement when it comes to fairytales, so I'm happy with whatever surprises you choose! Thanks for the giveaway! Both options are tempting, but the mystery box would be fun I think. Lots of Fairy Tale books. Thanks for the awesome giveaway. The mystery box would be so awesome to win. I love picking up random books when possible. There are so many books I want to read right now. I love surprises, so I'd go with the mystery box. I wouldn't be disappointed if something from your March video is in it. Love the video presentation, I'll be back. Any fairy tales retelling would be wonderful. I do love surprises. ^O^ Thanks. I love that it is a surprise! Mystery box. I need some good dreamy reads. Mystery Box sounds fun! Thanks for the chance! Fairy Tales are huge at my library ! Thanks for sharing!!! I'd probably choose a fairy tale book, maybe Helen Dickson's Beauty Tempts the Beast or Deborah Hale's Beauty and the Baron. The mystery box sounds like fun! I hope there is a fairy tale retelling in it, but I'm not too picky about what it is. Maybe Cruel Beauty by Rosamund Hodge. It just came out and I've heard positive things about it. I love mystery boxes! I would love Scarlet and Cress since I only own Cinder. I also really want to read Dorothy Must Die and Splintered. But I love surprises so I would be happy with anything! I would definitely choose the mystery book. I LOVE retold fairy tales, but I haven't read nearly enough of them. Hmmm... I'm definitely intrigued by the mystery box! Some titles I'd love would be Cinder, Scarlet, Cress, Dorothy Must Die and Unhinged, but I'm sure there are lots more fairy tale retellings I'm not even thinking of! I don't know if I would pick the mystery box or the other prize. But If I picked the mystery box it would be super cool if Scarlet and Cress were in there since I only own Cinder! :) Thank you for this cool giveaway! I`ll go with the mystery box! I'd get a book from TBD because shipping is expensive to my area. Wow, I love surprises so I don't want to give ideas of what I want because what I want is a surprise. =P Thank you so much for the giveaway. I don't know many fairy books so it would be ideal to get the mystery box but I'm international follower so maybe a book from the TBD. I still don't know what I'll pick though. The mystery box sounds fun! i'll take my chances with the mystery box!! A signed copy of Cruel Beauty would be AMAZING! I'm hoping for some Fairy Tale re-tellings. HEART’S BLOOD by Juliet Marillier - a BEAUTY AND THE BEAST re-telling. It's amazing. I would love any book, but I really hope for Splintered and Unhinged! For either prize, I'd love to see Cruel Beauty! I've been dying to read Strands of Bronze & Gold ever since you talked about it in one of your vlogs, Misty, so I would love to win that. I love Fairy Tale retellings... so I would hope the mystery box has some YA Fairy Tale Retellings! I would choose Scarlet by Marissa Meyer as my prize. I can't wait to read it. I would choose either Dragonwitch by Anne Elisabeth Stengl, Cinder by Marissa Meyer, Ella Enchanted by Gail Carson Levine, or Cybele's Secret by Juliet Marillier. Fairy Tale books is what I would hope for in the box! As far as a book to choose, I honestly have NO CLUE! There are so many that I would love to have. How do I choose? Thanks for the giveaway! I think Cress from Lunar Chronicles! I'd love to see *Ever After High* in the Mystery Box. I am really curious about the mystery box. I love surprises and since I'm so very behind on reading the fairy tale retellings, I'd love to see your best recommendations. I've only read The Golden Apple so far. If I win, I'd love for you to send a taste of your favorites. I would definitely choose the Mystery Box! I also would love to see Unhinged in there. I've been dying to read this series! Fairy tale romance books Thank you for the chance. I would choose the mystery box, as i love suprises!! A book that I would not have thought to pick up but it ends up being really, super awesome, and it ends my reading slump! Or you know...Scarlet by Marissa Meyer. I don't know but I love surprises! Thank you for the chance to win! I think I'd love the mystery box! I usually really like control of what I read, but for once, I'd like to throw that to the wind! As long as you love what is in the box itself, I'm willing to read it! :-) Thanks! I think I'd like to have Cress. A bookmark or a magnet for my fridge that is book related! I would choose the mystery box and I would love to find Scarlet or Cruel Beauty. Thank you for the giveaway! Maybe Towering by Alex Flinn but anything would be great. Some really great fairytale romance books. I'm in for the mystery box, as I love fairy tales and surprises! I'd hope for a retelling of Beauty and the Beast because it's my favorite fairy tale. I would love a surprise! Maybe something sweet? I love fairy tales and fairy tale retellings. I am really wanting to read Unhinged. Cruel Beauty also looks interesting. I would so choose the mystery box because who doesn't love surprises!? I would like if Cruel Beauty or one of Iron Fey series books were in the mystery box. I would love the mystery box! My favorite fairy tale retelling has been the Lunar Chronicles, each book has been better than the last! I would love to choose a book!